Gastric balloon, also known as the intragastric balloon is an inflatable medical device made of silicone, placed in the stomach to achieve weight loss. It’s a form of non-surgical management of obesity. It has an advantage of being less invasive, temporary, reversible, cheaper, and is an outpatient procedure. 1.7 How is the balloon placed in the stomach? 1.8 How does gastric balloon works? 1.9 How long a gastric balloon stays in the stomach? 2 Am I Eligible For Gastric Balloon? 4 How Effective is the Gastric Balloon? Orbera intragastric balloon: it is the most frequently used, and most studied intragastric balloon and were previously known as BioEnteric Intragastric Balloon. Orbera is an FDA-approved obesity treatment device that uses one balloon, placed endoscopically to induce weight loss. ReShape Duo Balloon: also known as “ReShape Integrated Dual Balloon System. The device is made of 2 balloons that are connected by a silicone shaft. 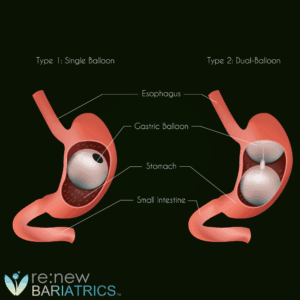 The ReShape Duo Balloon system is an FDA-approved weight loss treatment, which is different by placing two, interconnected balloons in the stomach endoscopically. Obalon Intragastric balloon: this balloon is also swallowed and then inflated with about 250mls of air. Up to three oblong balloons can be placed in the stomach. It is the first and only swallows balloon device approved by the FDA. However, at the end of 6months, the balloons are deflated and removed by endoscopy. Spatz Gastric Balloon System: though yet to be approved by the FDA it’s available in many countries including Mexico. The Spatz Adjustable Balloon system is available for commercial use in over 32 countries. It is the only intragastric balloon device that is being used for up to 12 months. Elipse: though not FDA approved, this balloon does not require endoscopy for placement. The balloon is swallowed like a tablet under fluoroscopy guidance and subsequently inflated with saline water via the tube that is attached to it. The removal also does not need an endoscopy; the balloon spontaneously deflates after about 4months and is subsequently excreted. Heliosphere bag: inserted by endoscopy but inflated with air. Compare the differences between Gastric Sleeve vs. Gastric Balloon. Renew Bariatrics recommends the Gastric Sleeve in Tijuana for the longterm weight loss compared to the Gastric Balloon. Under conscious sedation, the balloon is placed into the stomach by an upper gastrointestinal tract endoscopy. The endoscopy tube is passed through the mouth and via the esophagus into the stomach. Once the balloon is in the stomach, it is inflated with normal saline or air (normal saline is preferred) and left to float in the lumen of the stomach while the endoscopy tube is removed. However some of these balloons such as Elipse, Obalon do not require endoscopy for placement or removal. How does gastric balloon works? The mechanism of action of the gastric balloon can be likened to that of restrictive bariatric procedures. The inflated gastric balloon takes up about 80% of the capacity of the stomach leaving only 20% for food. This makes the patient feel the sense of fullness following ingestion of small amount of food. The ultimate goal is to reduce food intake and induce weight loss. Like other bariatric procedures, it must be complemented by dietary and lifestyle modification. How long a gastric balloon stays in the stomach? The balloon is usually removed by endoscopy after 6months post-insertion. This is done to prevent injury to the wall of the stomach and to avoid in-situ degradation of the balloon. Am I Eligible For Gastric Balloon? As a preemptive therapy for weight reduction in obese patients (BMI ≥ 30) at risk for disease development, at high risk for all-cause mortality, and with a high cardiovascular risk profile. Those with mild obesity (BMI ≥ 30 ), where recovery from metabolic disease is the primary concern may also benefit from the gastric balloon. Co-existing illnesses, such as hyperlipidemia, type II diabetes mellitus, and hypertension, could be notably improved or resolved with even a modest reduction in body weight. Those with a BMI > 35 with or without comorbidities, and who could not achieve long-term weight loss with a weight-control regimen. Patients with a BMI ≥ 40 primarily as a preparation for bariatric treatment or in patients with increased surgical risks. Obese patients who reject bariatric surgical procedures or who do not have an approach for surgery can also opt for it. Gastric balloon placement should be avoided in the following conditions. How Effective is the Gastric Balloon? Studies have shown that the average percentage excess weight loss (EWL) after six months of balloon placement is 32% however by 1year (6months after removal of the balloon) the percentage EWL was 10.9% (Ganesh, Rao, Baladas, & Leese, 2007). This is nevertheless significant as it has been discovered that 10% reduction in excess body weight significantly reduces obesity-associated comorbidities (Evans & DeLegge, 2011). In another study, the percentage EWL after 1year of insertion (6months after removal) was found to be 14% to 50.9% (Kim, Chun, Choi, Kim, Keum & Jeen, 2016). This wide variation in percentage EWL is due to the difference in the effectiveness of various types of gastric balloon. Gastric balloon is one of the endoscopic treatments of obesity. It’s a safe and effective procedure that may serve as an alternative to bariatric surgery. The major complications of the intragastric balloon are gastric ulcers, gastric erosion, and esophagitis, spontaneous deflation of the balloon, gastroesophageal reflux. There are also a few reported cases of gastric perforation, dilatation and small intestinal obstruction (Coskun & Bozkurt, 2009). The side effects associated with gastric balloon are nausea, gastric discomfort, bloating, vomiting and abdominal cramps. Others include belching, constipation, diarrhea, gas, difficulty swallowing, sore throat, vitamin/mineral deficiencies, hiccups, sense of heaviness with back pain. However, most of these side effects are transient and self-limiting and only in few cases will medications be required. Obesity has become a thing of concern in our generation and will likely remain a source of concern for many years to come. About 13% of the world’s adult populations were obese as at 2014, and the proportion of obese individual is fast rising. The comorbidities associated with obesity such as diabetes mellitus, cardiovascular diseases, stroke, etc. have remained the leading causes of death worldwide. Management of obesity involves the dietary and lifestyle adjustment which has been shown to be less effective in morbidly obese patients (i.e. those with BMI >40). Another option for management is surgery. Many surgical procedures are available to achieve weight reduction, and they are collectively known as bariatric surgeries. However, many patients may have one or more conditions that make them ineligible for surgery. Therefore, there is a need for better modalities of treatment that will achieve a significant weight reduction within the shortest period in patients that are not fit for surgery. This is where endoscopic bariatric procedures come in. Learn how to undergo affordable Gastric Balloon in Mexico? Contact Renew Bariatrics, a leader in Weight Loss Surgery in Tijuana to learn more about your options.